I-85 has two business loop freeways commissioned over older alignments of the Interstate mainline. The lone business loop in South Carolina is an eight mile freeway running between I-85 and the city of Spartanburg. The limited access road serves the Spartanburg County communities of Fairforest, Johnson City, Lone Oak and the University of South Carolina Upstate. Interstate 85 through the Spartanburg area was constructed in the 1950s as a bypass route for U.S. 29. Traffic growth along the substandard freeway through the 1970s and 80s overwhelmed the route, resulting in plans to either widen it or replace it with a new alignment to the north. Ultimately a new route for I-85 was chosen in 1986 as it would minimally disrupt existing traffic patterns and not involve costly upgrades to the old route. Work broke ground in 1988 on the new six-lane alignment, with completion in early October 1995. 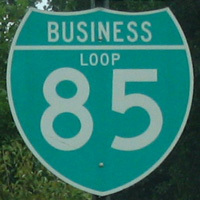 As approved by AASHTO on April 2, 1995, when the new route opened, old I-85 was redesignated as Business Loop I-85. A follow up by Mike Whitt on December 14, 2000 revealed that SCDOT required $150 million in construction to modernize the business loop freeway. Additionally, the community was generally apathetic and non-supportive about the issue. SCDOT offered instead to place overlays displaying “Freeway Loop” on guide signs for Exits 69 and 77 on I-85. Subsequent attempts by the SHA were planned in 2001 and 2002 to convince area residents that the Spartanburg was losing out on opportunities to bring in added revenue from motorists bypassing along Interstate 85.
Business Loop I-85 superseded U.S. 29 & 70 along the Temporary section of I-85 through Lexington, Thomasville and High Point. 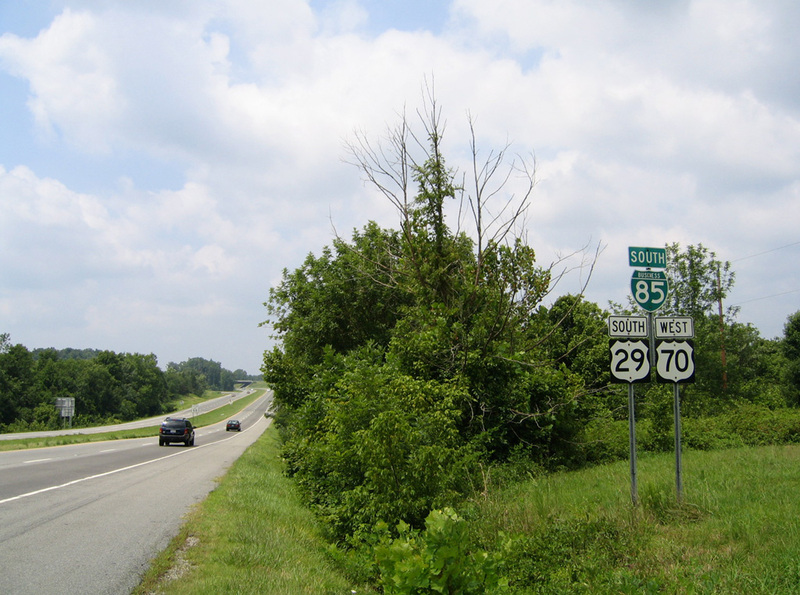 Portions of the route include 1950s era expressways built to join the three cities with Greensboro to the northeast. This section travels 30.8 miles from a wye interchange (Exit 87) in southwest Lexington to a trumpet interchange (Exit 118) on the outskirts of Greensboro. U.S. 29 & 70 overlap with the entire route, while the southern four miles coincides with U.S. 52 and the Future Interstate 285. 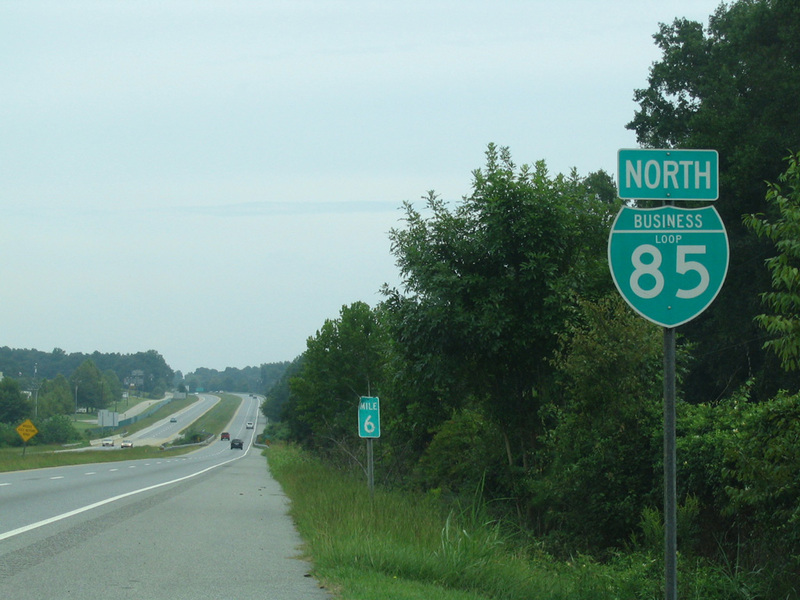 With the completion of the Interstate 85 bypass around Greensboro (Painter Boulevard) on February 22, 2004, Business Loop I-85 was extended northward over the former I-85 route through the city. This included an implied overlap with I-85 between Exits 118 and 120A extended the Business Loop mileage, and exit number sequence, through Greensboro to the merge with I-40 south of Downtown. Interstate 40 and Business Loop I-85 combine for eight miles east to merge with I-85 at Exit 131 and I-840 on the east side of Greensboro. Completion of the southwest leg of Painter Boulevard on February 21, 2008 shifted I-40 to bypass the city to the south, partially along side I-85. This coincided with the redesignation of the original Interstate 40 across Greensboro as new Business Loop for I-40. 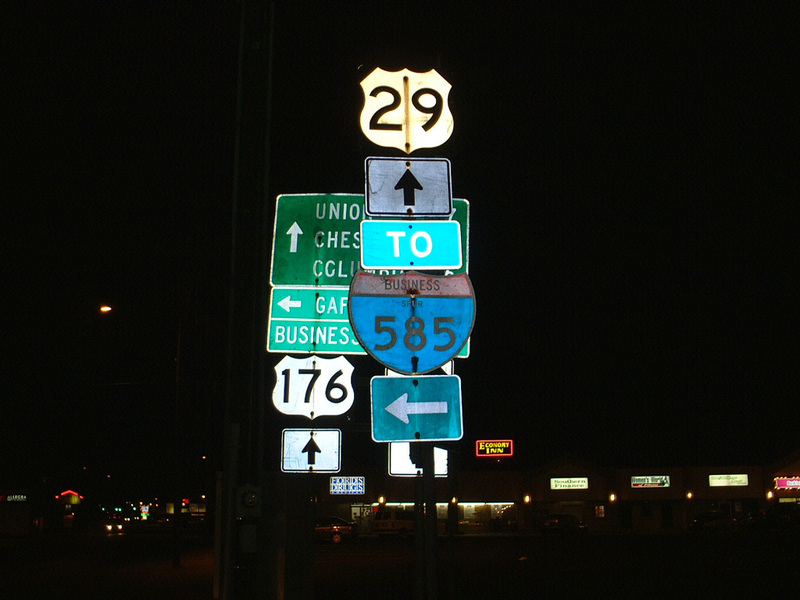 The sign changes lasted just seven months before I-40 was returned northward. The new alignment of Interstate 85 around Greensboro was approved by AASHTO on May 14, 2004. The old alignment of Interstate 85 was approved as an extension of Business Loop I-85 at the same meeting. SCDOT actively inventories Spurs and Connector routes in their U.S. and State Highway systems. 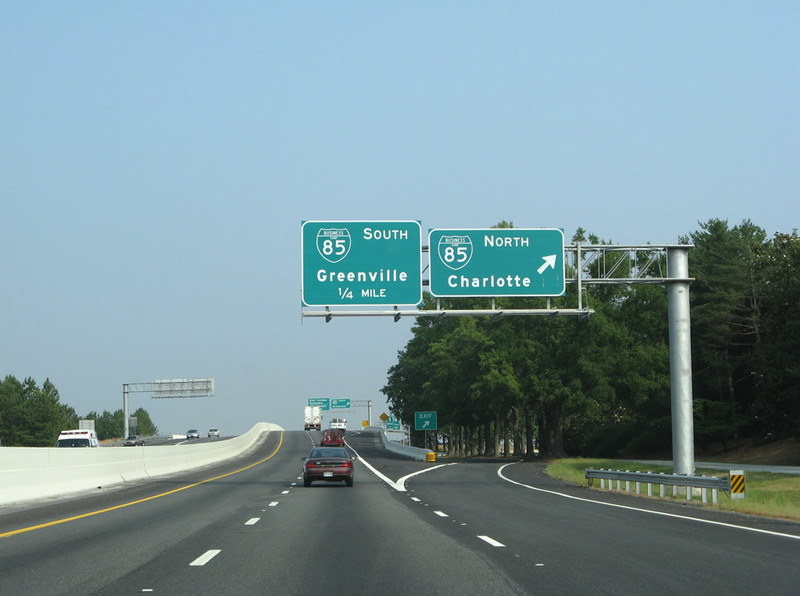 Four of the S.C. Interstates were given Spurs as well, including the north end of Interstate 385 outside Downtown Greenville. Business Spur I-385, an unsigned route as of 2004, extends west from the freeway end of I-385, 0.49 miles to U.S. 29 (Church Street) in the Greenville central business district. The route was signed along U.S. 276 (Stone Avenue / Laurens Road) at its diamond interchange with I-385 south and Business Spur I-385 north until fall 2003, when construction to expand I-385 rebuilt that exit. 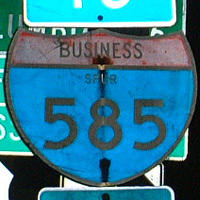 When work was completed in 2004, signs for the business spur were not replaced. Business Spur I-585 overlays U.S. 176 & South Carolina 9 along Pine Street south from the I-585 freeway end to Garner Road. The route consists of one sign, which erroneously references Pine Street north of Garner Road as the mainline of Interstate 585. 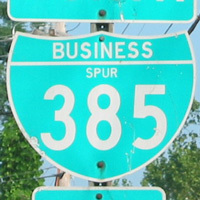 Until 2001, a tri-color Business Spur I-585 shield was posted at Main Street (old U.S. 29) and U.S. 176 & S.C. 9 (Pine Street) east of Downtown Spartanburg. North of that intersection, a trailblazer for I-585 stands along Pine Street, leaving no other references to the business spur in place. Whitt, Mike, “Business 85 in Spartanburg, SC.” Message to Andy Field. March 31, 2000. E-mail. Interstate 585 & U.S. 176 west at the three-quarter cloverleaf interchange with Business Loop I-85 at Spartanburg, South Carolina. Photo taken 06/01/07. 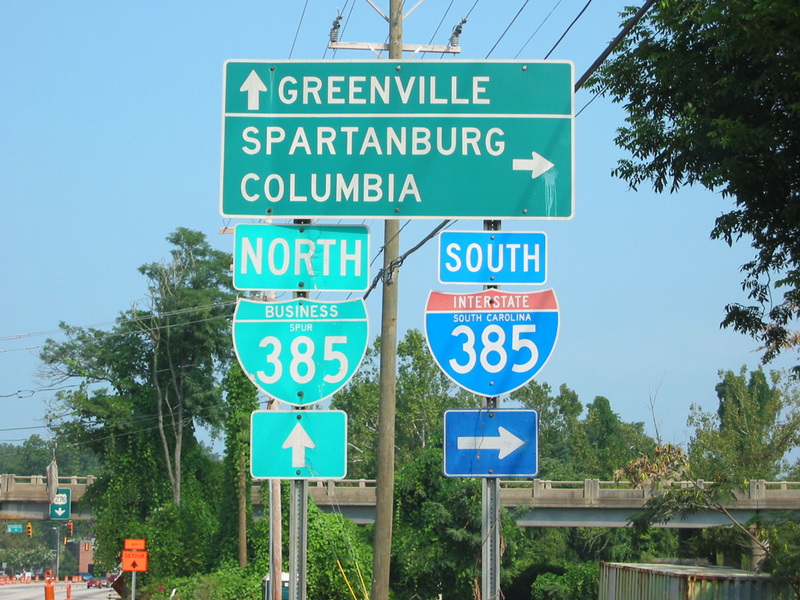 The relocation of I-85 away from Spartanburg left I-585 disconnected from the rest of the Interstate system. Later construction extended the freeway northward to Fairforest Road, but still just shy of I-85 at Exit 72.
Business Loop Interstate 85 & U.S. 29 south and U.S. 70 west split with Interstate 85 en route to High Point, North Carolina. Photo taken 07/24/04. The implied overlap between Interstate 85 and Business Loop I-85 between its High Point and Greensboro portions is the only case where a business loop and its parent share an alignment.